The completed scroll after Camille finished the paint and gold. Size: Calligraphy space is 6" x 7.75". 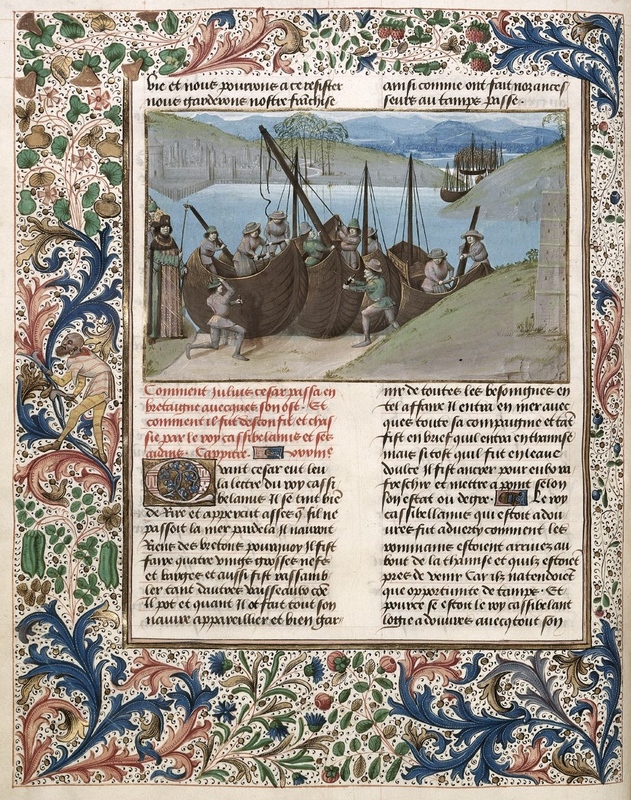 The first volume of the Recueil des croniques d’Engleterre by Jean de Wavrin, Seigneur de Forestel, British Library Royal MS 15 E IV. I was thrilled to get a chance to pen some of Alys' words! Why was I so excited? Sometimes modern English doesn't look medieval on the page to me. There are good reasons for this: Medieval texts, regardless of what language they are in, typically have fewer uppercase letters and longer sentences, allowing for large blocks of text that are all lowercase. There's more to it than this though. Modern English wording also uses different words and combinations of letters. Mistress Alys has a knack for writing texts that look, feel and sound medieval. She has a lovely blogpost of her own on the writing of the words if you want more details. 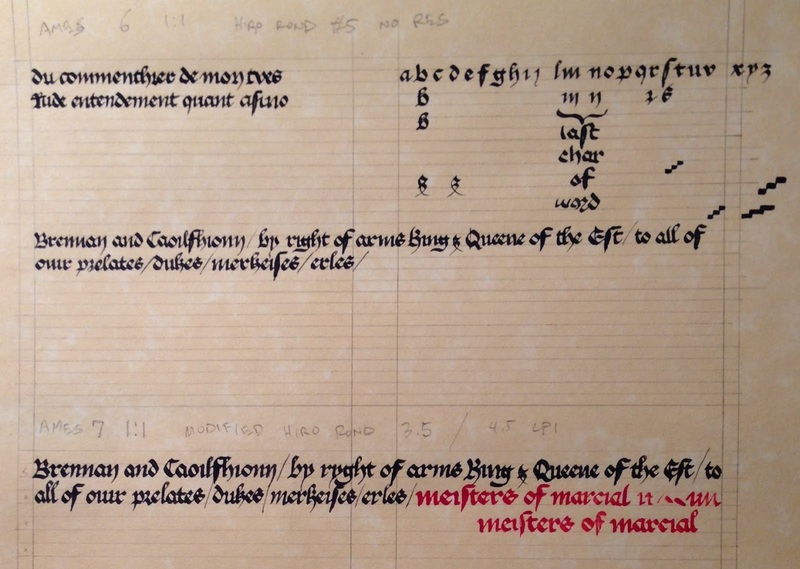 For this scroll, she used medieval sentence structure, words and spelling. As I started practicing the script, I ran into my first challenge: sizing! I couldn't find a nib that allowed me to fit the text onto the page they way I wanted it to... So I grabbed a sharpening stone and narrowed a 3.5 a bit until I had it the correct width. Nib sizing figured out, I practiced on some pergamenata to figure out what ink I wanted to use. I eventually settled on the Blot's Iron Gall and Winsor & Newton Red, but it took a bit of struggle. Finally, I got to work. In addition to the nib and ink fighting me (the ink just didn't want to flow easily), it took a surprising amount of concentration to write the words as Alys wrote them... The words are in English, so my brain wants me to spell them the modern way, even though that isn't what Alys wrote. I spent a lot of time talking to myself to keep the proper letters in mind. Despite (or perhaps because of) these struggles, I'm very happy with the outcome. I tried very hard to copy the punctuation style used in the original example. Instead of commas, I used a slash. Alys' text contained heavy use of the ampersand (&) character, which added a wonderful touch as well. Looking at what I can improve upon first: My hand is still a bit heavy. I need to return to practicing with Mitchell nibs and goose quills to see if I can lighten my touch and start to master the fine lines and subtlety that I see in the exemplar I used as inspiration. The original's scribe had a more flowing hand than I do, and I'd love to gain that level of artistry and flow with my letters. That said, I am very happy with the results; it feel right, and out of the corner of my eye I think it flows the same as the original. I definitely credit Alys for a lot of that, but I'm happy to say I think I did her words justice with my pen. For comparison, I give you my finished calligraphy, guidelines still intact. Note the coloring of the blank Iron Gall ink; as I learned in my ink testing, it takes several days to darken on Pergamenata. The left column was completed about 24 hours before the right. Compare the image below to that of the finished scroll at the top of this article to see the darkening that occurs over time. 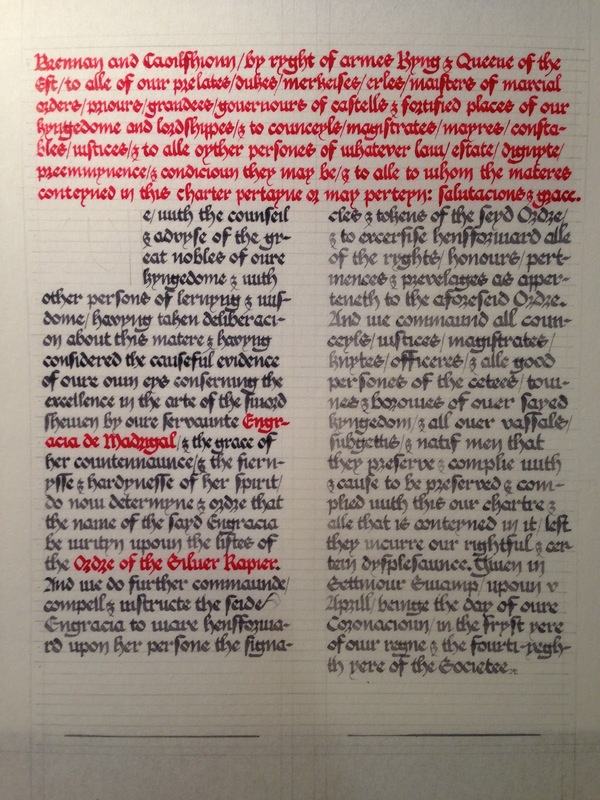 For those who want to see more pictures of the process of illumination and paint, Camille has a gallery of her process showing how she took it from my calligraphy all the way to the final scroll.